On December 19th, 1972 Apollo 17 splashed down safely in the Pacific, bringing a close to the Apollo programme lunar missions. 45 years later, no other humans have stepped foot on the Moon. PTScientists is working hard to bring down the cost of lunar exploration, provide essential infrastructure, and increase access to space. Here are the final 15 in our set of ’45 facts to mark the 45th anniversary of Apollo 17′. How many of them are new to you? 31) Harrison Schmitt was first assigned to fly on Apollo 18, but when the mission got cancelled, he was assigned to Apollo 17 instead, replacing Joe Engle. 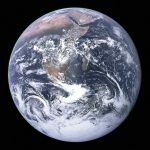 32) One of the most widely used photographs ever taken is the image of Earth – nicknamed “Blue Marble” – that was taken by the crew of Apollo 17 on the way to the Moon. 33) The sixth automated lunar research station was set up on the Moon during Apollo 17. 34) Before they left the Moon, Harrison Schmitt noticed that Gene Cernan was going to throw his hammer. He asked if he could throw the hammer instead and Cernan replied “You deserve it. A hammer thrower…You’re a geologist. You ought to be able to throw it” – but warned him not to hit the lunar roving vehicle or the experiments with it! 35) Gene Cernan didn’t plan his exact words he would say before he stepped off the surface of the Moon for the final time. He said they came to him a few minutes beforehand. 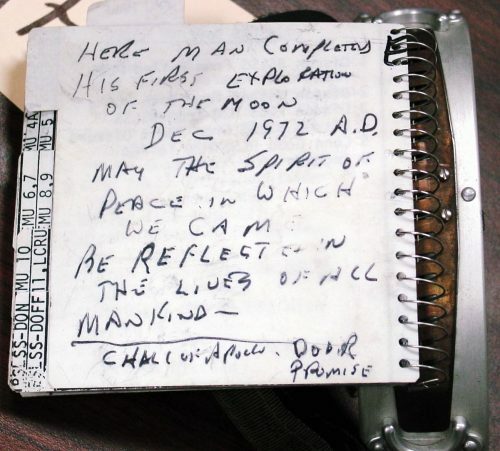 Cernan did however make a note of the words on the plaque they took to the Moon, on back page of his cuff checklist. 36) Gene Cernan commissioned space artist Robert McCall to design the mission patch. The image of Apollo in the patch is directly based on the statue of Apollo displayed at the Vatican. 37) Apollo 17 was the only time cameras successfully captured astronauts launching from the surface of the Moon. The camera was mounted on the lunar rover, and was timed just right to film the ascent and keep the spacecraft in frame. 38) After launching from the surface of the Moon, the lunar module docked with the command and service module. They then jettisoned the ascent stage which crashed into the lunar surface, and the impact was recorded by scientific instruments from previous Apollo missions. 39) Apollo 17 brought back 110 kg of Moon rock – the largest haul of any Apollo mission. 40) On return to the Earth, the capsule splashed down in the Pacific Ocean and was recovered by USS Ticonderoga. 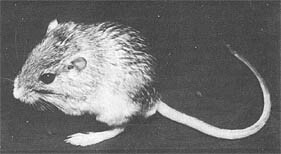 41) Five pocket mice were taken on the Apollo 17 flight and stored in the command module for radiation tests. 42) Lunar Module Pilot Ronald Evans was previously a Navy pilot who flew planes from the USS Ticonderoga during the Vietnam war. He was serving on this ship when he learned he had been selected for the astronaut corps. This USS Ticonderoga was also the ship that recovered the Apollo 17 crew after splashdown in the Pacific! 43) The Apollo 17 command module, America, is currently at the Johnson Space Center in Houston, Texas. 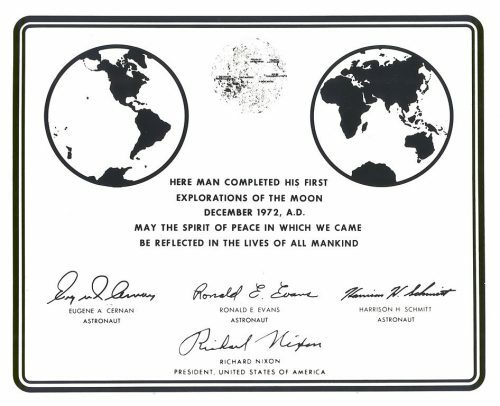 44) Each Apollo mission that landed on the Moon left a plaque with the astronauts’ signatures, but Apollo 17 was one of only two missions which had an inscription about the mission and President Nixon’s signature. The other was Apollo 11. 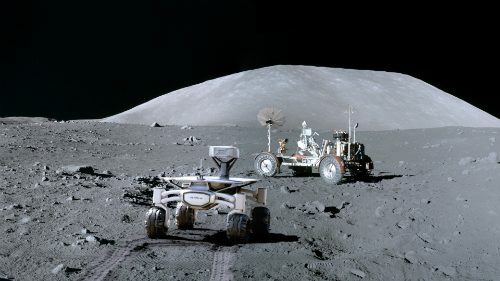 45) The lunar roving vehicle used by Gene Cernan and Harrison Schmitt during their time on the Moon has been sitting on the lunar surface for 45 years – and no-one has seen it clearly since they left the Moon. NASA’s Lunar Reconnaissance Orbiter captured images of the Apollo 17 landing site, but with each pixel representing around half a metre the resolution makes it impossible to see the rover in any detail. PTScientists wants to return to the Taurus-Littrow Valley and get the first high-definition images of the original lunar rover to see what state it is in after 45 years being exposed to the harsh environment of the lunar surface. That’s all folks! Thanks for joining in our celebration of 45 years since Apollo 17 with 45 facts. You can find facts 1-15 here and 16-30 here. Ad astra!